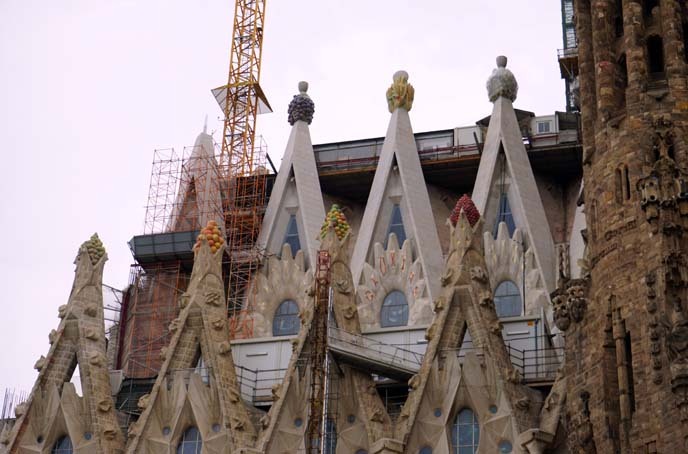 Modern art & architecture in Spain: new travel show video! Gothic Quarter shopping in Barcelona. 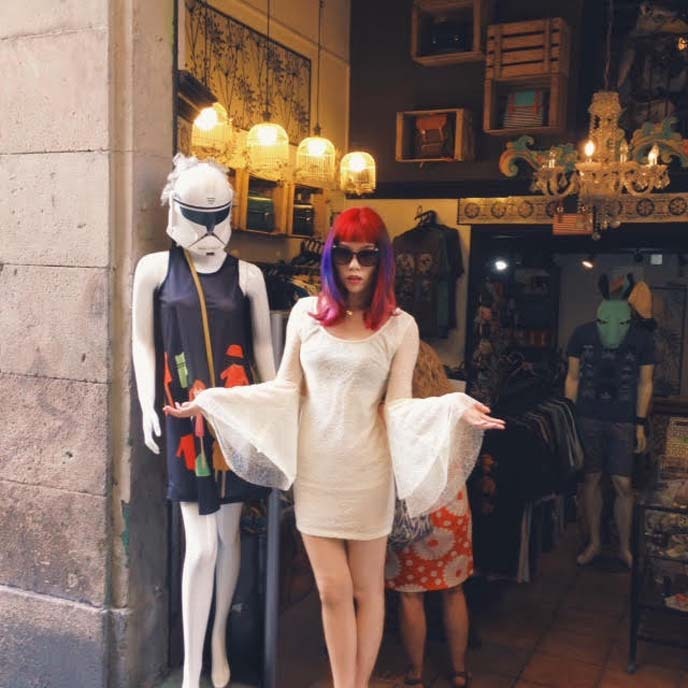 There’s no better place in the world to wear a skull cut-out dress… than the Gothic Quarter of Barcelona. My filmmakers and I got to explore this fascinating neighborhood, thanks to Visit Spain and Eurail. As we walked through the narrow streets, we came across Star Wars stormtroopers, twee murals, and retro indie fashion. But first, as my speech balloon indicates… Our Spain travel video is out today, on Business Insider Travel! From Las Ramblas in Barcelona to the Alhambra of Granada, watch as I dive into the country’s art and culture. Produced, filmed and edited by Borderless Media. I’m always amazed at how they capture our adventures and make them come to life. 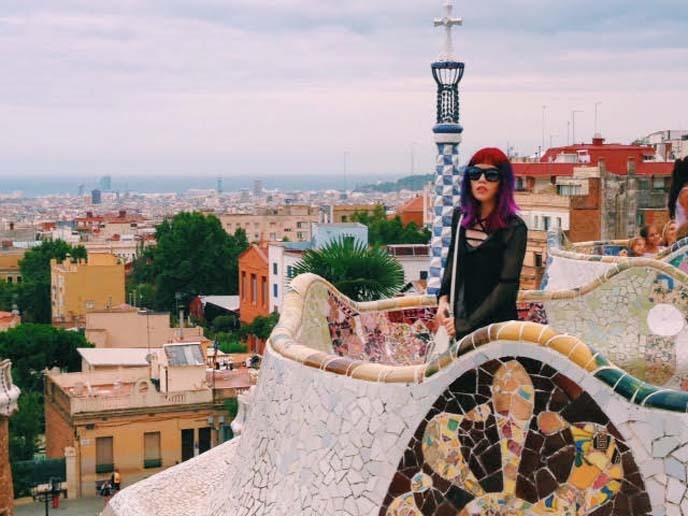 Please take a moment to watch our Spain tourism video above, on Business Insider, and on @LaCarmina YouTube. Perhaps you’re eyeing my outfit of the day. I adore this dress from Pretty Attitude Clothing, featuring a white cobweb print, lace skull cut-away back, and dangling bell sleeves. My necklace is from an LA company, Vidakush Jewelry. The pendant is the word “universe” in Sanskrit. Most tourists start at Las Ramblas, the main shopping street of Barcelona that holds the famous market (Mercat de La Boqueria, or St Joseph’s Market). It’s worth checking out Ramblas, but I found it too tourist-driven and commercial for my taste. 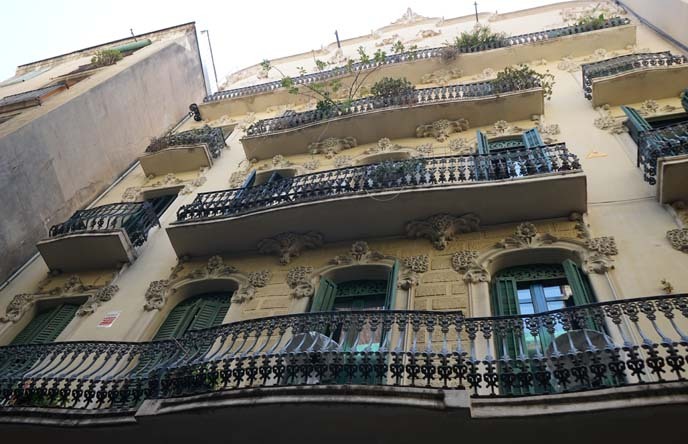 Instead, I encourage you to explore two of my favorite Barcelona neighborhoods: El Raval (see my travel guide here), and the spooky-named Gothic Quarter. 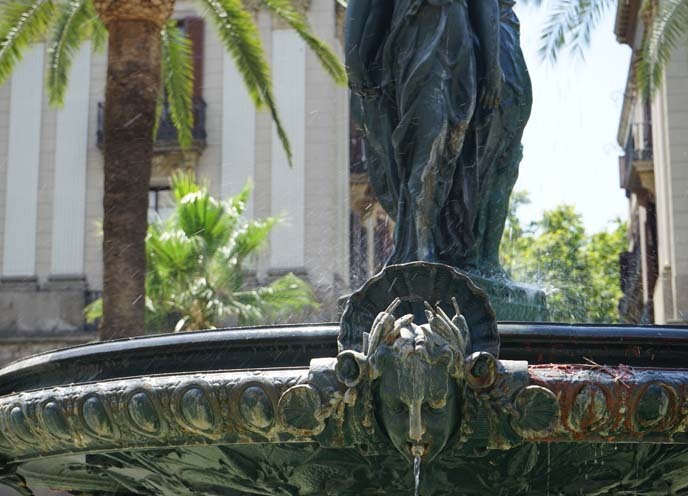 To get to the Gothic Quarter, you can start at Plaça Reial square near Las Ramblas, and keep on walking east. This grand, “royal” plaza was designed in the 19th century, and features lanterns by Gaudi. 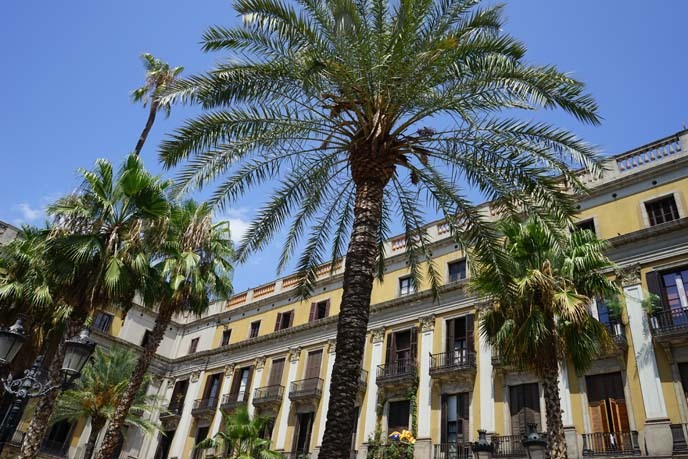 Many people meet up at Placa Reial, and the atmosphere is especially abuzz at night. We wandered into the El Barri Gòtic, the center of old Barcelona. Many of the walls and buildings date back to Medieval times, or even further back when the Romans occupied the city. The Gothic Quarter is famous for its narrow, labyrinthine, cobblestone pathways. It’s great fun to stroll around, and take in the stone walls and art nouveau buildings on the way. Similar to El Raval, there’s an artistic, indie feeling to this district. We spotted cheeky street art on the century-old walls. 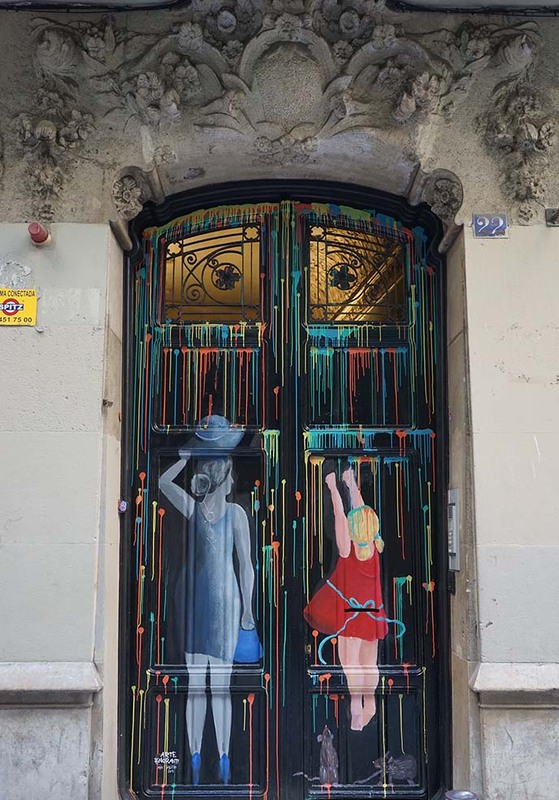 These old-fashioned Roman door knockers got the graffiti treatment, next to a striking mural that makes use of the doorway as a canvas. The Gothic Quarter is my favorite area for shopping. 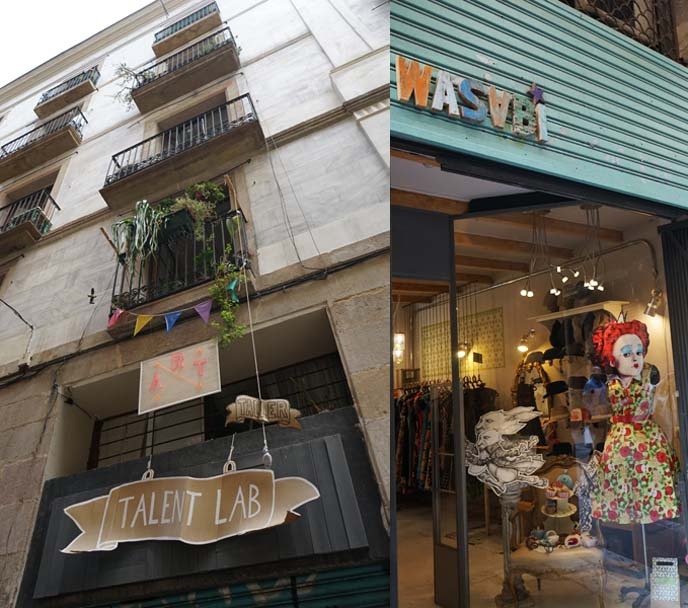 It’s filled with quirky, independent local boutiques — especially on the street Calle Avinyo. Instead of commercial brands, you’ll find innovative design shops. Like this one, which lets you customize your own lamp from a rainbow of colorful balls. 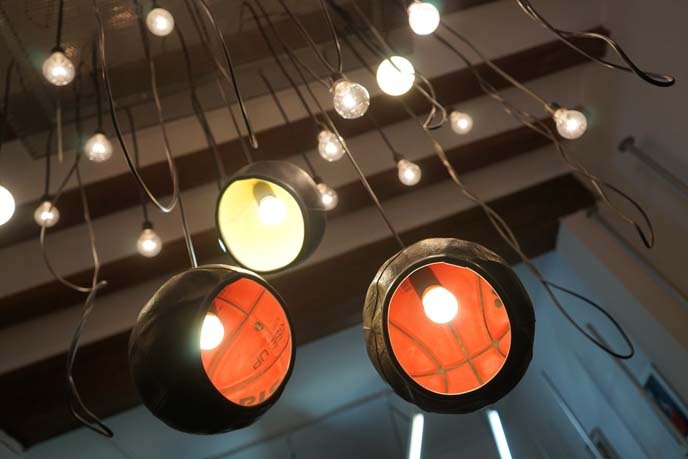 The artists turned unexpected materials, such as basketballs, into hip lighting fixtures. We popped into artisan shops that sold handmade purses, crafts, and other design objects. 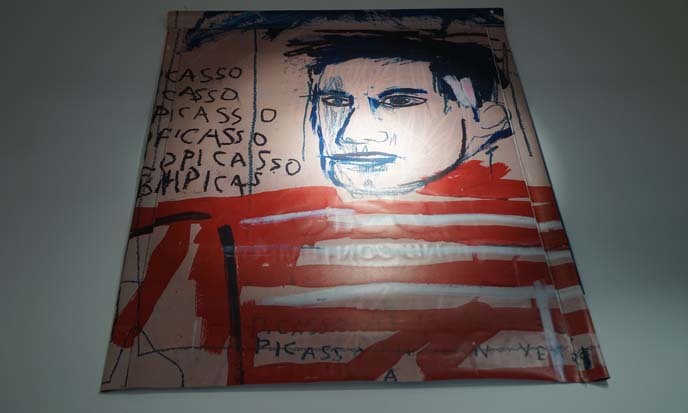 I think Spanish Cubist artist Picasso would be pleased with the creative scene here. 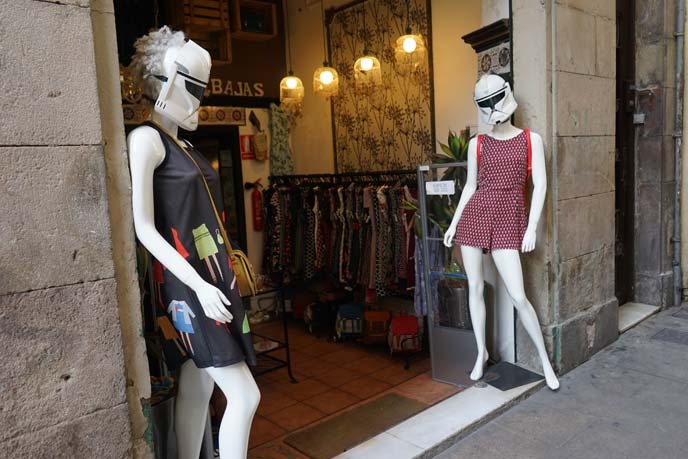 The Force is alive and well… in the Gothic Quarter! This clothing shop paid homage to Star Wars. Have you ever seen Stormtroopers looking so fabulous? I spent the afternoon browsing Spanish retro and vintage fashion boutiques. Their items are one of a kind, and not expensive. My Pretty Attitude lace dress would fit right in with the cool fashion found here. 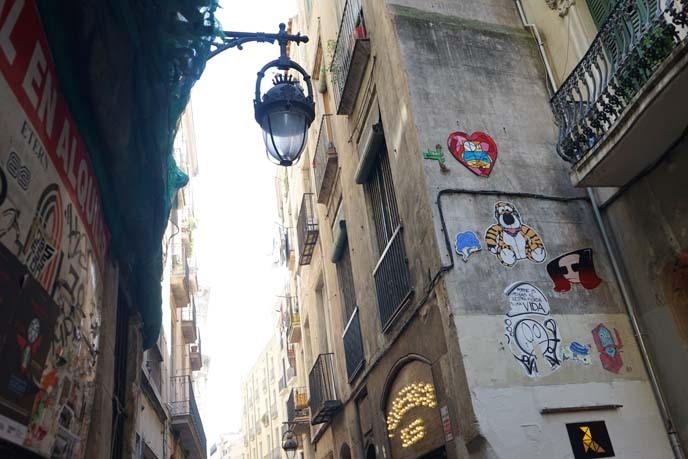 With an edgy creative culture and skull street art, the Gothic Quarter lives up to its name. And now, we have to say “adiós”… because this is my last post about Spain, at least until I visit again! If you missed my previous stories about Barcelona and Granada, see them all here. Gracias for watching our Spain travel video here! A Gaudi tour of Barcelona! Park Güell architecture, Sagrada Familia church, El Born restaurants. Are those… gingerbread houses? Almost. 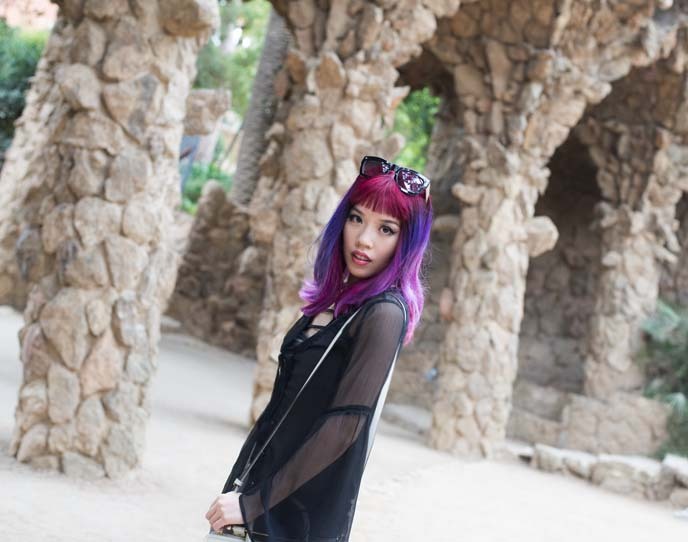 I’m standing in Barcelona’s Park Güell, which looks like a real-life candyland! I’m sure you are familiar with the terrace in the photo above, designed by the extraordinarily progressive architect Antoni Gaudí. 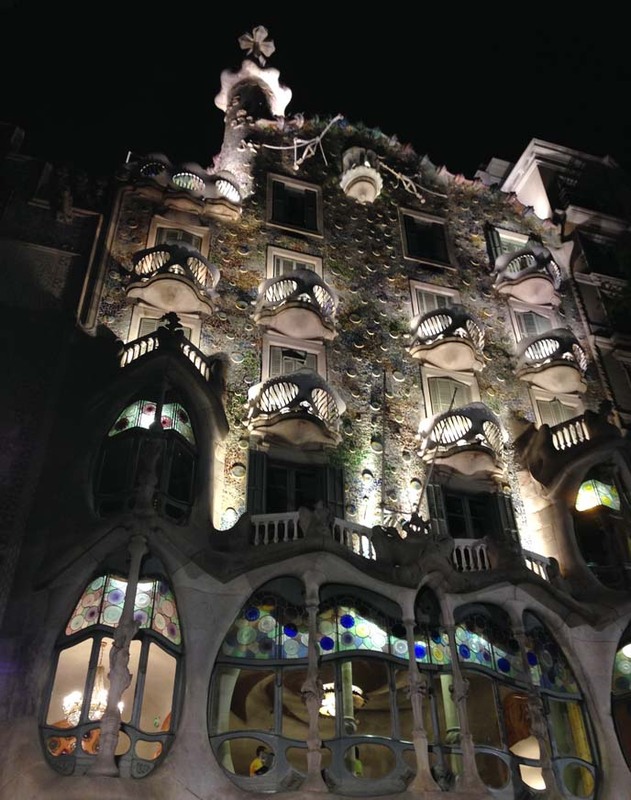 Let me take you a tour of his most famous buildings including La Sagrada Familia cathedral, and the spooky house of bones — Casa Batllo. Finally, we’ll end with a round-up of my favorite food around the world, including the best Spanish cuisine in Barcelona. Sound good? Then ¡vamos! 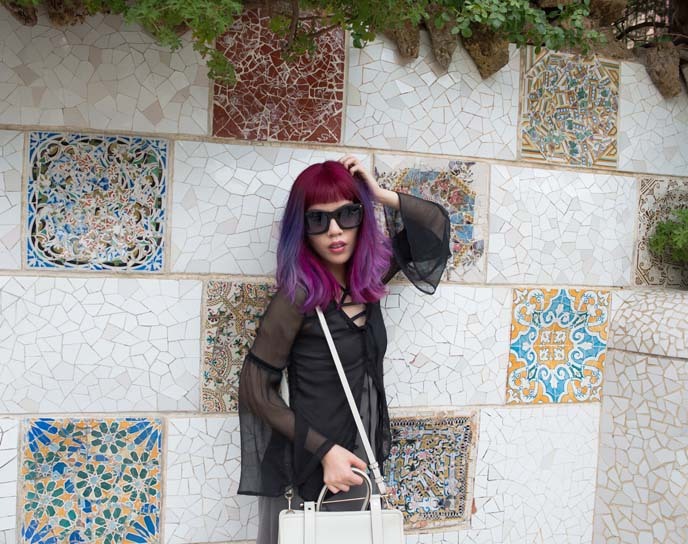 With its electric-colored tiles and daydream atmosphere, Park Guell is my type of hangout. Recently, I’ve been dying my hair a lighter shade of purple. My stylist Stephanie Hoy (at Stratosphere hair salon in Vancouver) did this vivid ombre color, which shifts from magenta to purple to lavender. 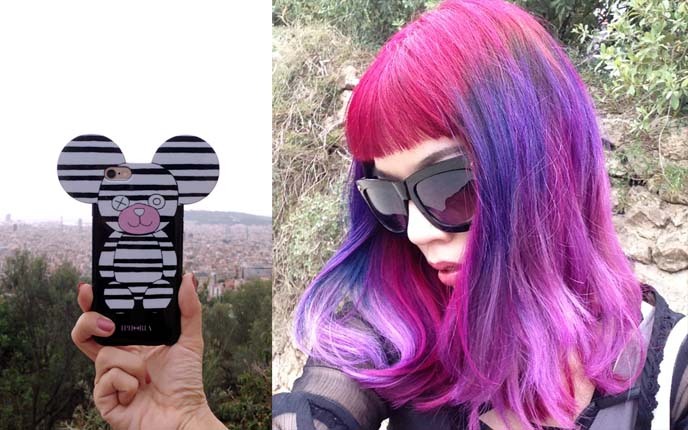 Thank you to Stephanie for all the rainbow hairstyles and dyes over the years! 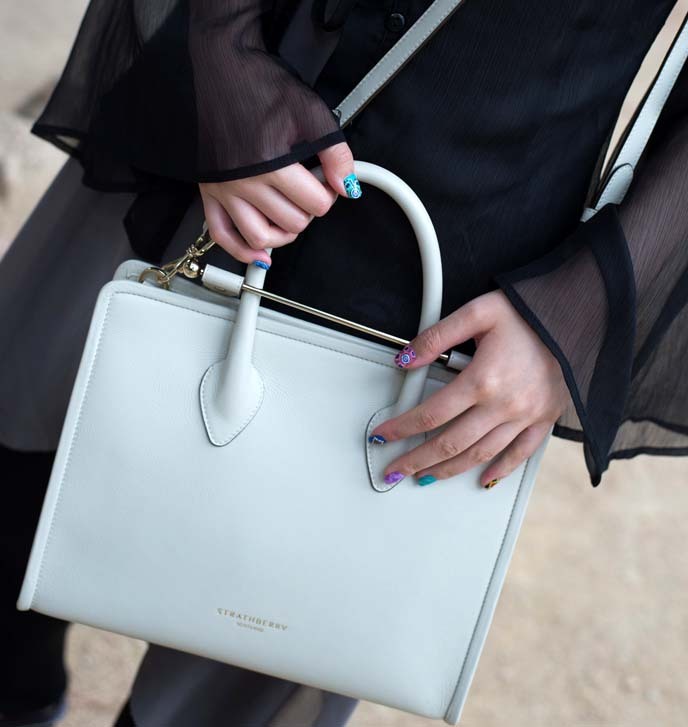 I wore my white leather tote from Strathberry of Scotland. Their purses are modern and minimal, yet made with time-tested craftsmanship. I’m always up for supporting independent design studios that create thoughtful, high-quality works like these. You can check out their entire collection here, including my Strathberry tote bag. I recommend booking your entrance tickets in advance from the Park Guell site, since they only release 400 tickets every half hour. Every ticket has a timed entry, so make sure to arrive well in advance of your time slot. If you show up and buy a ticket at the door, chances are that you can’t go inside the terrace until a few hours later — but you can explore the surrounding gardens in the meantime (no fees or restrictions there). We had a bit of time to kill before going inside, so we walked around the park. Gaudi integrated winding stone arches and pathways into the greenery, mimicking the organic forms. 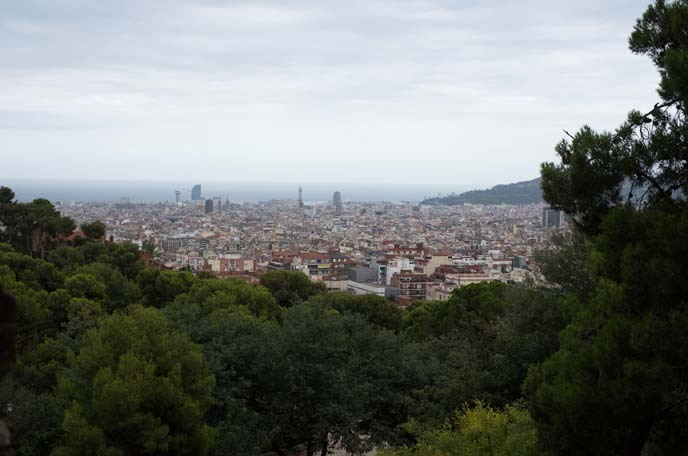 From up high, we took in this view of Carmel Hill and surrounding Barcelona neighborhoods. 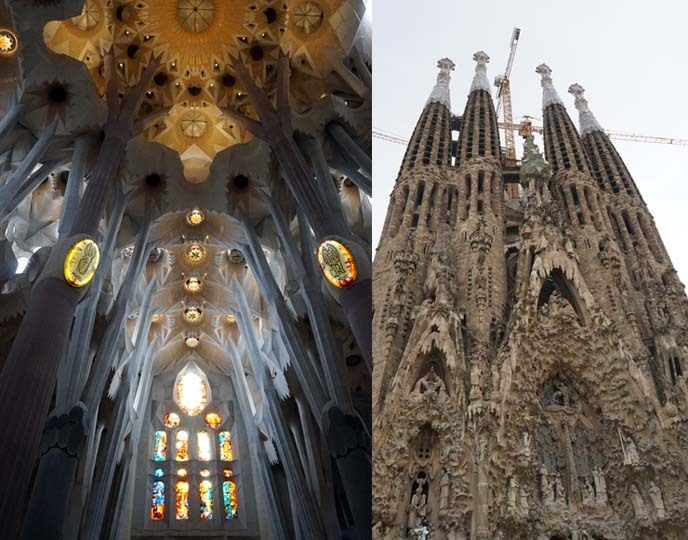 Gaudi’s design is a masterpiece of Catalan modernism / naturalism, with influences from mythology and the Temple of Apollo of Delphi. The staircase is guarded by a serpent, whose head pokes out of a Catalonian coat of arms. When we reached our ticket entry time, we stepped inside the roped-off area and onto the famous terrace, or “Monumental Zone.” A long bench twists around the perimeter, like a sea serpent glistening with multi-colored mosaics. Each section of the tiled bench had different colors and patterns. This type of broken-tile mosaic is called Trencadis, and was a feature of Catalan modernism design. 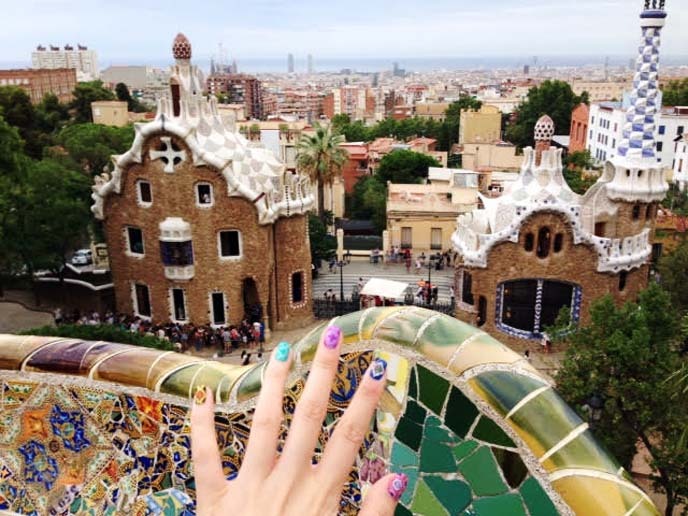 I purposefully matched my nail art to the Spanish themes and colors of Park Guell. 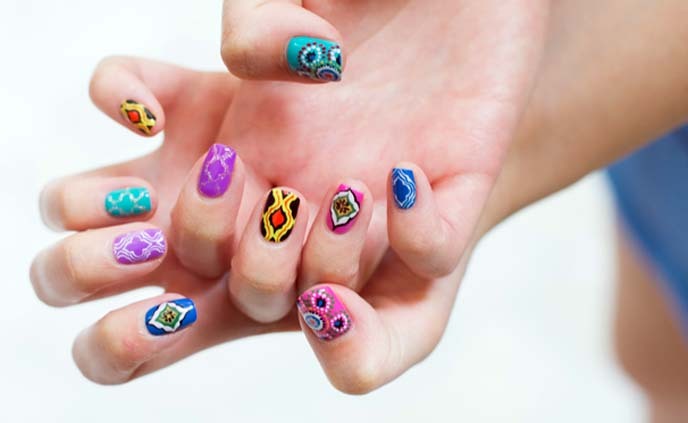 My gel nails are by Glam Nail Studio in Richmond, BC (near Vancouver). There’s an Alice in Wonderland sense of whimsy, everywhere you wander in Park Guell. At the same time, the forms feel natural and not disorienting. From every angle, the organic forms become part of the landscape. 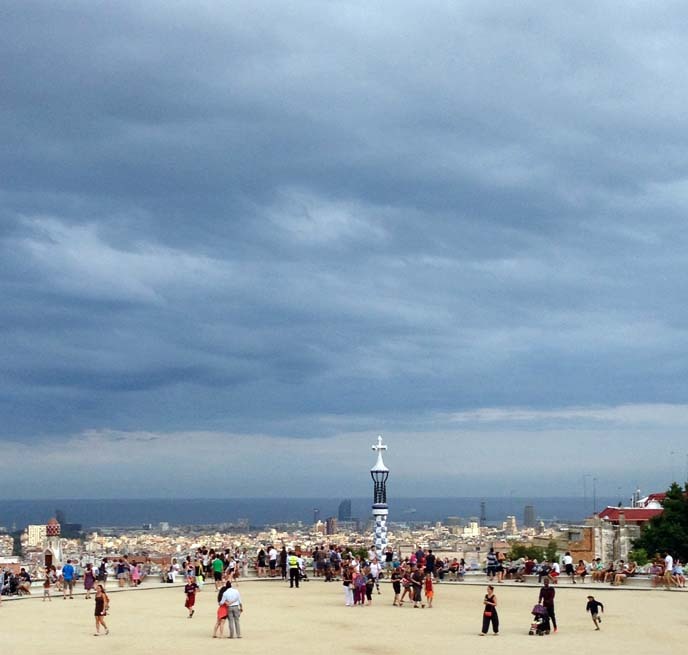 The terrace overlooks the best panoramic view in Barcelona. Visitors can go inside Gaudi’s “gingerbread house,” which looks like the witch’s lair in the Hansel and Gretel fairytale. 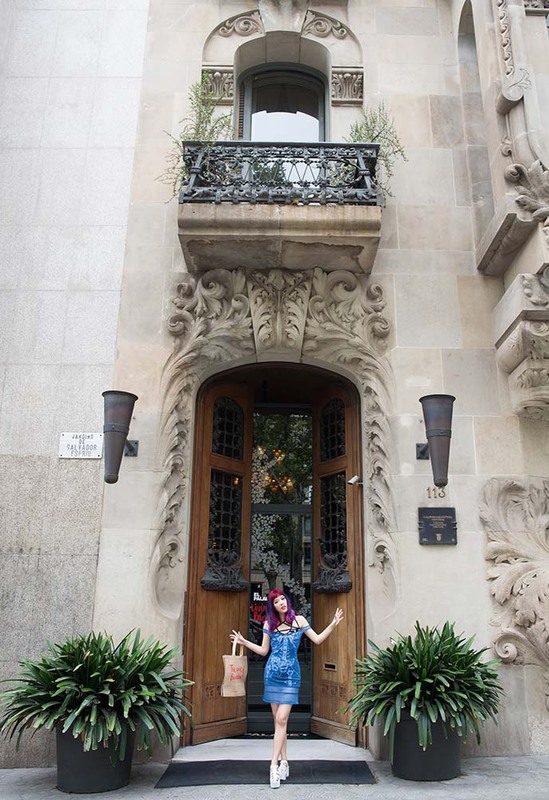 The spooky Casa Batllo is located near our El Palauet hotel, at Passeig de Gràcia 43, 08007. Visitors can find out more and purchase tickets to see this moderniste-Gothic masterpiece here. 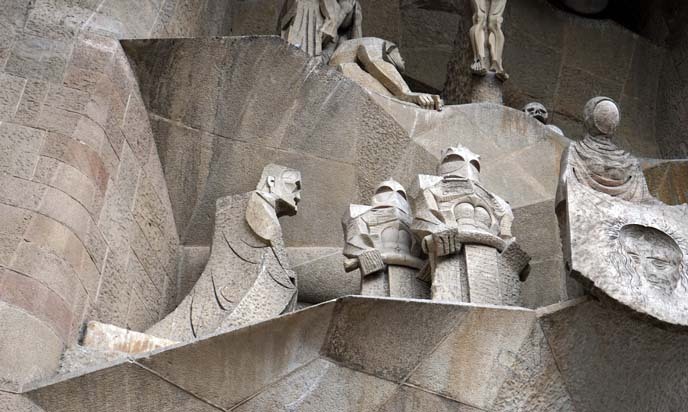 Gaudi remains the most celebrated architect in Barcelona, and his spirit lives on in the funky public art and sculptures found around the city. 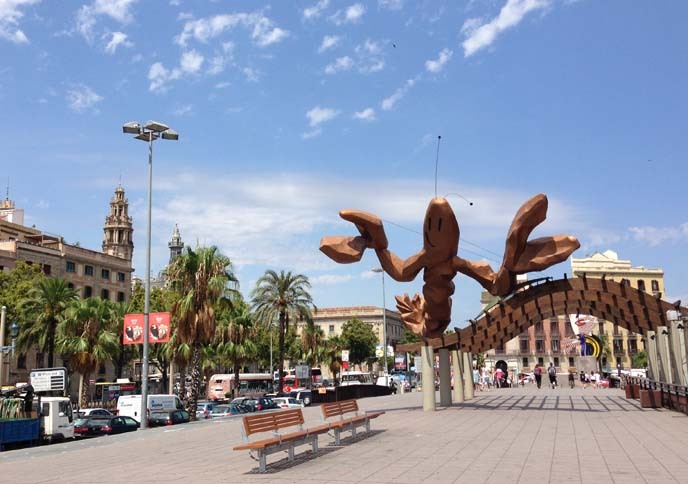 Near La Barceloneta (the beach district), we spotted this happy-faced giant lobster statue. We saw impressive street art everywhere, especially in El Raval (the former red-light district, now one of the coolest areas of Barcelona). 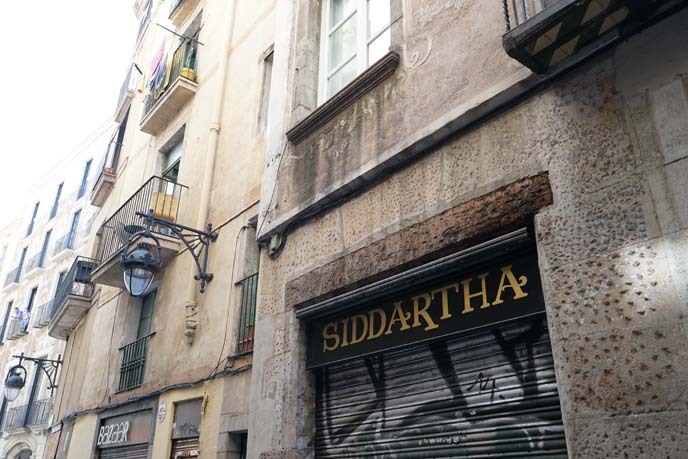 If you’re curious to see more, I wrote an entire guide to the El Raval hipster neighborhood. Finally, no Gaudi tour is complete without going inside La Sagrada Familia. The controversial Catholic cathedral has yet to be finished, even though construction began in the late 19th century! 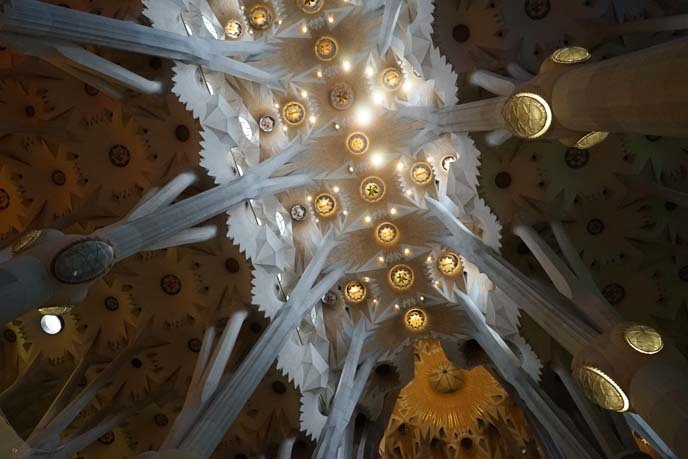 Gaudi was always ahead of the game, and during his life, citizens had mixed feelings about this ornate, experimental style. Today, the “Passion facade” (above) is one of the world’s most celebrated achievements in architecture. Since the construction is privately funded from donations and ticket sales, progress is slow and continuous. Can you believe that construction began in 1882… and is projected to be finished in 2026! When we visited, the window peaks were being topped with stacks of fruit. 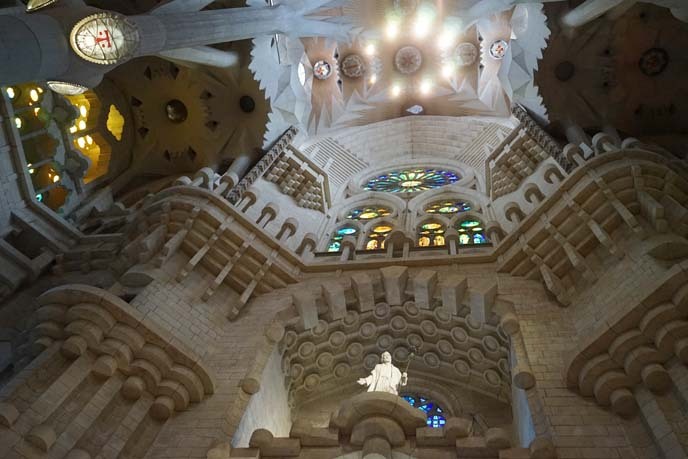 La Sagrada Familia is unlike any other church. Outside, you could spend hours looking at all the fine details of the facades. They show the apostles, nativity and more iconography – executed in curving, Art Nouveau style. Inside, the nave ceiling looks like a hybrid of trees and clockwork. The complex geometric layers create this glorious effect. Gracias to Spain Tourism and Eurail for making our trip to Barcelona possible. 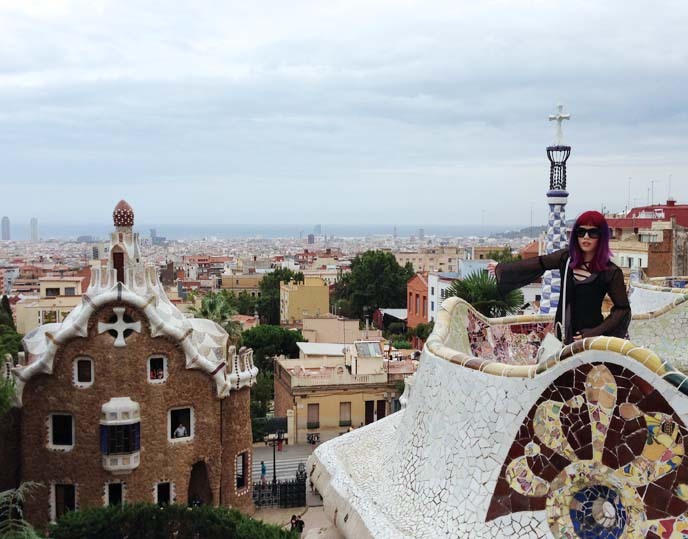 I hope our Gaudi adventures inspire you to see Spain for yourself. Another highlight of our Spanish journey: eating our fill of tapas! 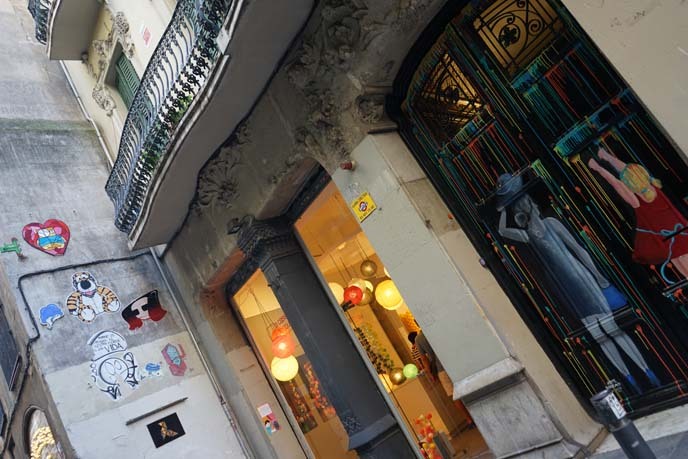 One of our favorite districts was El Born, a hip area surrounded by all types of ethnic restaurants. We met up with friends at El 300 Del Born (Plaça Comercial, 12, 08003), a laid-back Spanish restaurant opened by the Michelin-starred chef Jordi Vilà. It’s in the same glass cultural center that houses excavated ruins from the 18th century. 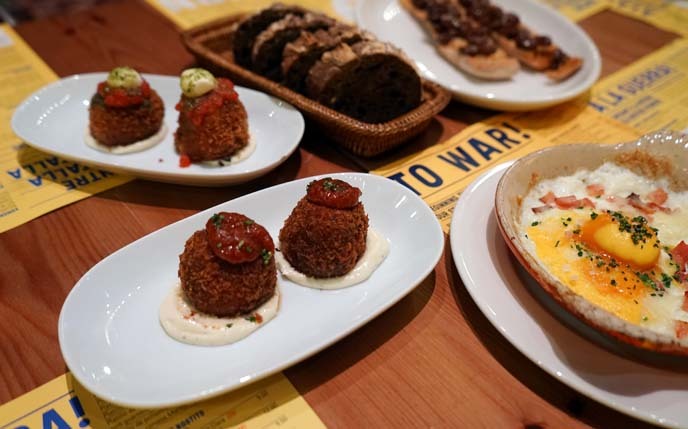 Tapas (small plates of Spanish food) are perfect for people like me, who like to try a bite of everything. 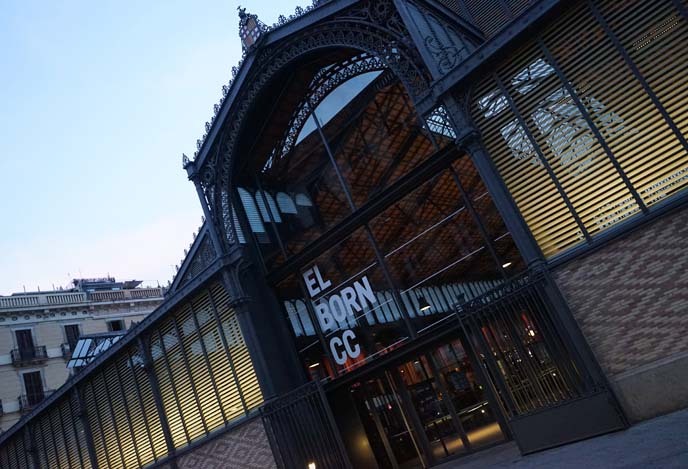 At El Born, we ate bombas, chocolate flat bread, baked eggs and other delicious Catalan specialities. You may have noticed that food has become a larger focus of my site lately. Since readers often ask me for restaurant recommendations in different countries, I thought I’d put together some of these “greatest hits” below. Enjoy, and add your own in the comments! Click the bolded titles for all the food posts from each location. Over the past few years, I’ve eaten and reviewed all types of restaurants in Hong Kong. 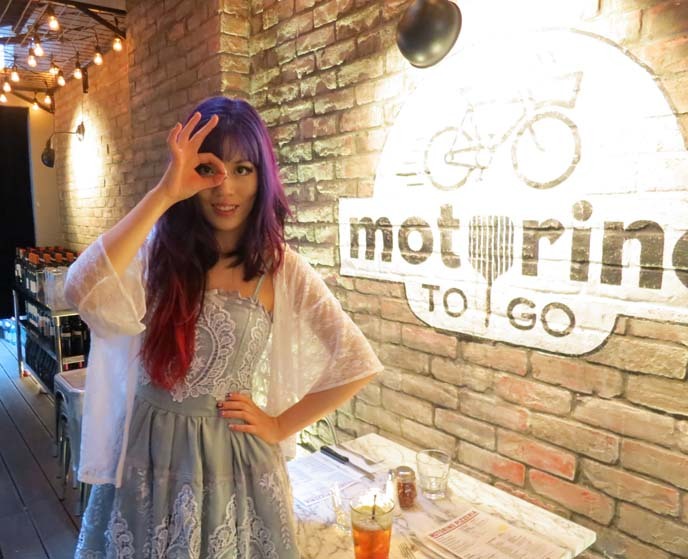 Of course, you can eat fantastic Chinese dim sum here — but I actually prefer dining out at international restaurants like Motorino Pizza (above). Hong Kong is a competitive culinary scene, and there are always new chefs coming here to make waves. Israel’s food scene took me by surprise, in the best sense. I had no idea the local food was so fresh, with a focus on local seafood, olives and vegetables. 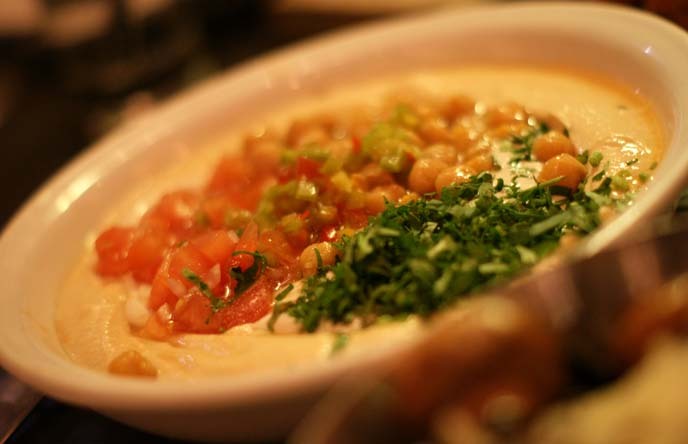 One of my favorite memories was eating at the hummus restaurant, where people from all backgrounds bonded over chickpea spread! 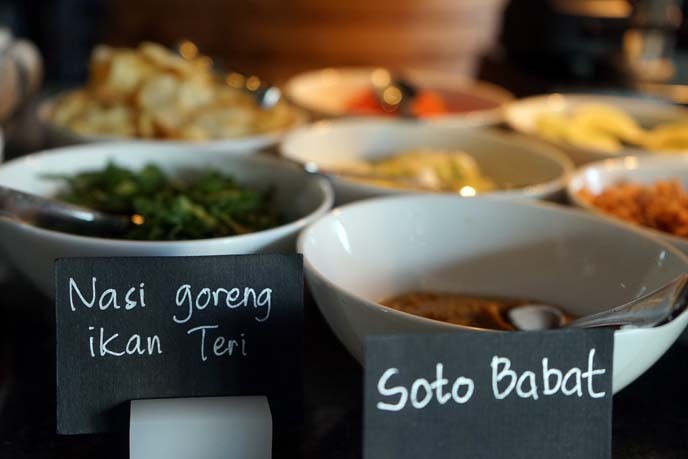 In Bali, I gained a new appreciation for cooking classes. My friends and I went to Jimbaran market with a chef. He then showed us how to make Indonesian dishes from scratch, beginning with spiced “bumbu” paste and ending with green pandan pancakes. I followed this up with a Vietnam food tour, where I made spring rolls with villagers and did a seafood cruise through Ha Long Bay. 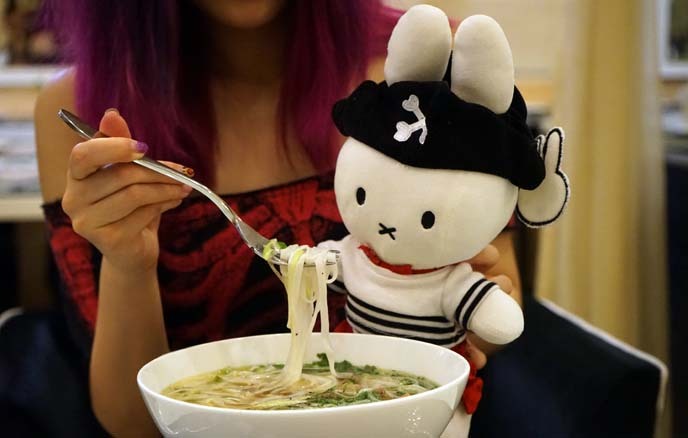 I still have many stories to show you from Southeast Asia… above is a preview of Pirate Miffy eating pho! By now, you’ve probably guessed that I am a fish and seafood addict. San Francisco deserves its reputation as one of the foodie capitals of the world. 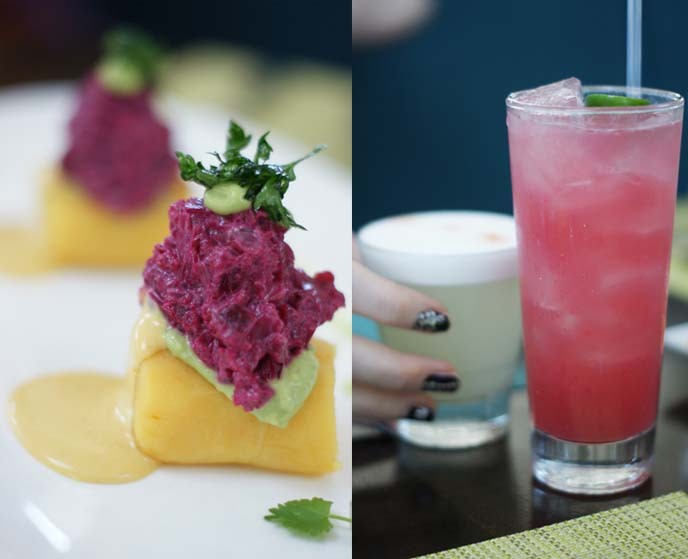 I gained a new appreciation for Peruvian cuisine here, especially the ceviche and pisco sours. Whenever I go abroad, I try to take a culinary tour with a local insider. In Budapest, we did a four hour walk-and-taste, where I tried specialities such as a bitter liqueur and sheep cheese chocolate. Many items are not exported out of countries (such as small batch wines, dark grain breads and soft cheeses), so eat to your heart’s content while you’re there. 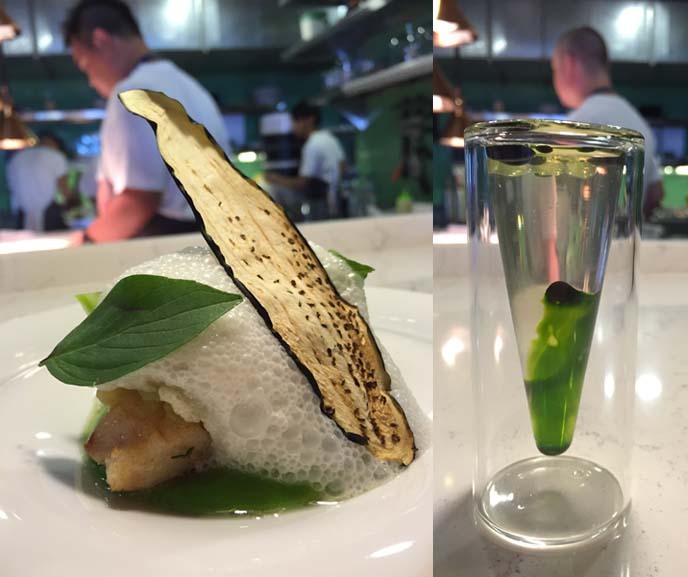 Molecular madness, hawker centers, charcoal laksa… Singapore’s food scene rocks. The chefs aren’t afraid to experiment, and you can get a world-class meal at any price point. We ate high, we ate low… and it’s all documented in my Singapore travel category. If I had to pick a favorite eating destination, I’d have to say Japan. At random hole-in-the-walls, you’ll find the best ramen and sushi of your life. 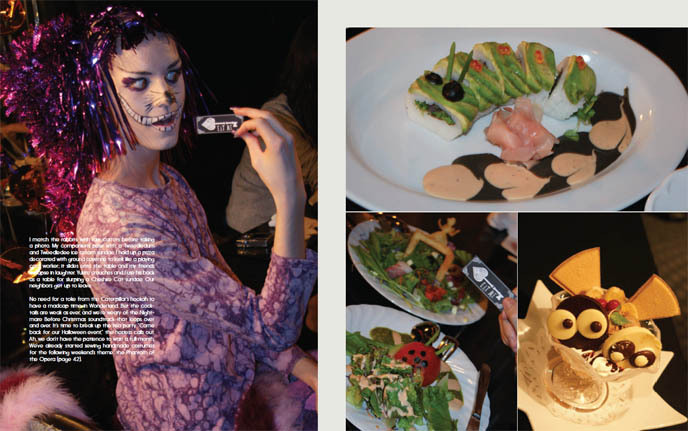 I’m also a huge fan of izakayas — yuzu sours, grilled fish — and themed eateries like the Alice in Wonderland cafe. 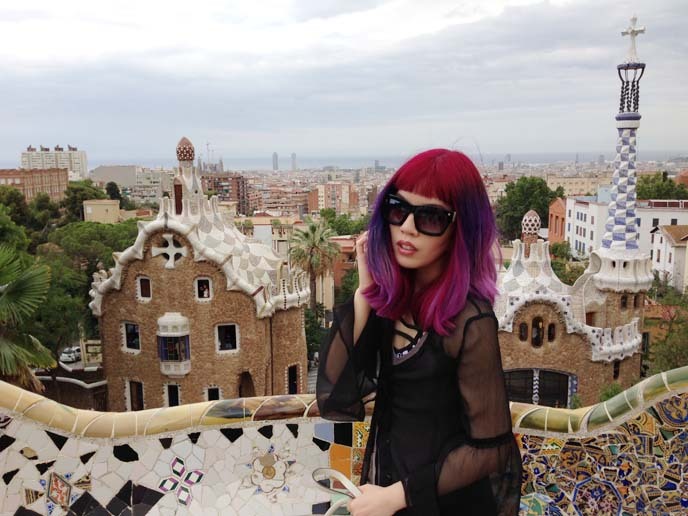 To see where I’ll be dining next — and my current hair color! 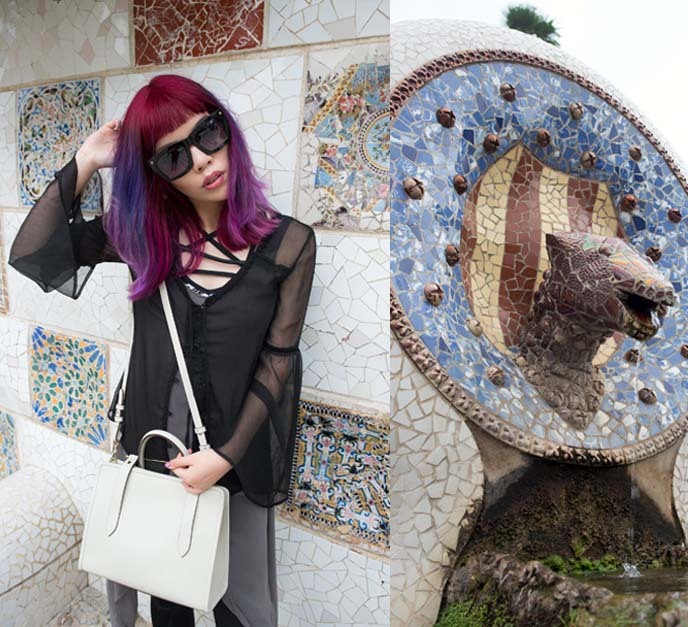 — feel free to add me on Instagram and Snapchat (@lacarmina).